What is an eco tour? Albatros Travel in Kenya are proud to be partners with Eco Tourism Kenya, an organisation which promotes responsible tourism practices within the industry. If one of our tours is labeled an eco-tour that means it only visits lodges which have been certified as undertaking best practices with regards to sustainable tourism, environmental impact and meeting social goals. Each lodge is awarded either a bronze, silver or gold eco-rating, depending on their demonstrated commitment to the above principles. To win an eco-rated certificate, lodges must demonstrate that they have, or are working towards, clearly outlined policies for conserving the environment, managing waste, preventing pollution, educating visitors and furthermore must invest in the local community and economy. 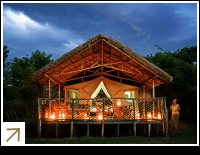 This camp, situated in the Masai Mara, was originally established by Albatros Travel and has been awarded the silver certification level from Eco Tourism Kenya for its efforts. The lodge is powered with solar energy, all wastewater is treated on site and extensive organic vegetable gardens provide much of the fresh produce for the guests. What’s more, the camp partners with a number of local organizations, such as the Woodlands 2000 Trust, to establish a forestry school, and it also trains local villagers to be chefs at its hospitality school. By bringing our guests to places like the Karen Blixen Camp Albatros Travel strives to make our business more sustainable. At present we are looking to further incorporate our ethos of sustainable tourism into our tours to include not just accommodation but transport too.